Rotterdam 6 — 7 Dec It's time for a system reboot. Gerd Kortuem is Professor and Chair of Internet of Things in the Industrial Design Engineering Faculty at TU Delft, principle investigator at the Amsterdam Institute for Advanced Metropolitan Solutions and member of the Delft AITech initiative on Meaningful Human Control Of Autonomous Intelligent Technology. His research focuses on the intersection of the Internet of Things and design and explores data, algorithms, and smart materials as key building blocks for intelligent products and services: How can designers effectively marshal these new design materials for product development? How can we understand and ensure accountability, transparency and sustainability of the Internet of Things and “intelligent” products and services? In 2002 he completed his PhD in the field of wearable computing and has since then investigated technologies for smart workplaces, public transport, domestic micro-grids, and community energy with companies such as BP, BT, E.On, and Tech Mahindra. Prof Kortuem has worked in various roles in the software industry (IBM, Apple and internet start-ups), and advises SMEs and start-ups on developing IoT products and business solutions. 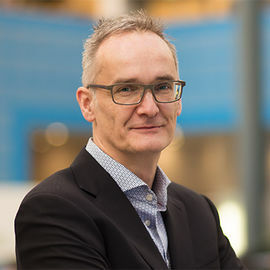 He has taught Software Entrepreneurship at Lancaster University and Saïd Business School, Oxford University, and was co-lead of the FutureLearn MOOC on Smart Cities. Prof Kortuem holds a PhD from the University of Oregon, USA and a Diploma in Informatics from Stuttgart University, Germany. He is an associate partner at strategic consultancy Fronesys Inc.
ThingsCon is a 2 day event, packed with talks, workshops and other events.